Found this very tiny small Coca Cola bottle in Amsterdam. Actually it is not that new but is sold in Europe but is not a normal bottle that is sold everywhere. However this one got a Dutch label and are sold in tiny Toko's in Amsterdam but is also sold in France and Belgium. You might think why 25 cl while you could buy 33cl can or a 50cl bottle. One thing is you can close it compared to the can and the other is is way smaller then the 50cl bottle and fits easier in your pockets, and for the little children is it a great size for them instead of giving them way too much to drink. The placement of this is between the cans and not between the bottles also the othe 25cl drink of Fanta is there too which I had already reviewed. Also it replaced the normal Coca Cola cans which I could not find it between their cans any more. But I think will soon see more 25cl bottles and less cans if this went all good, and see it in supermarkets instead of only at small shops. 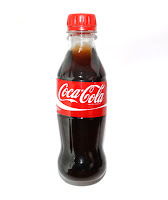 This is a picture of 0,25l , 0,5l and 1l Coca Cola bottles next to each other. You can see several difference between the bottles, with the 25cl you see it have a new cap with thick and bigger groves and the bottom is flat and not have the odd feets. Also no ribbles on the lower side for better holding grip, but actually the bottle fits very well in your hands. Am looking forward to see it in the normal supermarkets.